We started our school year at the end of August fresh and new. We had a new plan, new schedule, and renewed spirit for learning. Now, 7 whole months into the school year, we have already finished our Science curriculum and started a new one! We are flying through this year. If you're familiar with the "Christian Kids Explore" series, they are written by a homeschool mom who has blazed the trail with the rest of us. Each lesson offers teaching time and hands-on activities. There are also coloring pages, timeline activities, and other reproducibles in the back of the book. This book offers lots of flexibility and you can really make it fit your needs. It is scripturally based, presented from a Biblical world-view, and written in an easy to understand dialogue. You will want to allow longer for end of unit reviews/tests. We finished this curriculum fairly quickly, probably because of our new schedule, which is really working for us. I encourage you to try this curriculum. It is economic, flexible, informative, and you have the ability to take an active role, working one on one with your child, or step back and allow the child to be more independent. I love the fact that this product is not grade specific, but can span several grades and ability levels. You could easily use this with multiple-aged kids for a comprehensive Science curriculum. There is lots of information in this book, but it is offset with plenty of activity sheets, experiments, and more. You can really set your own schedule for this curriculum to fit your needs. It is a little hard to copy the pages in this book, so the CD really comes in handy when printing those pages. 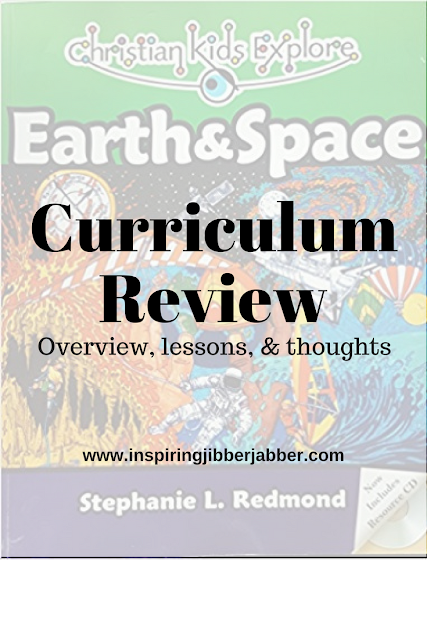 Here's my review on Christian Kids Explore Biology which we did a couple of years ago!